The primary function of the Youth Services Division is to serve as an administrative resource and to advise on the coordination of activities of Youth Councils throughout the Town. Through the Youth programs of the Town of Oyster Bay, activities are developed to address the needs of children throughout the Town. The Town’s Youth Services Division provides administrative and technical assistance to ensure the programs and activities are coordinated in a fashion that meets funding requirements. 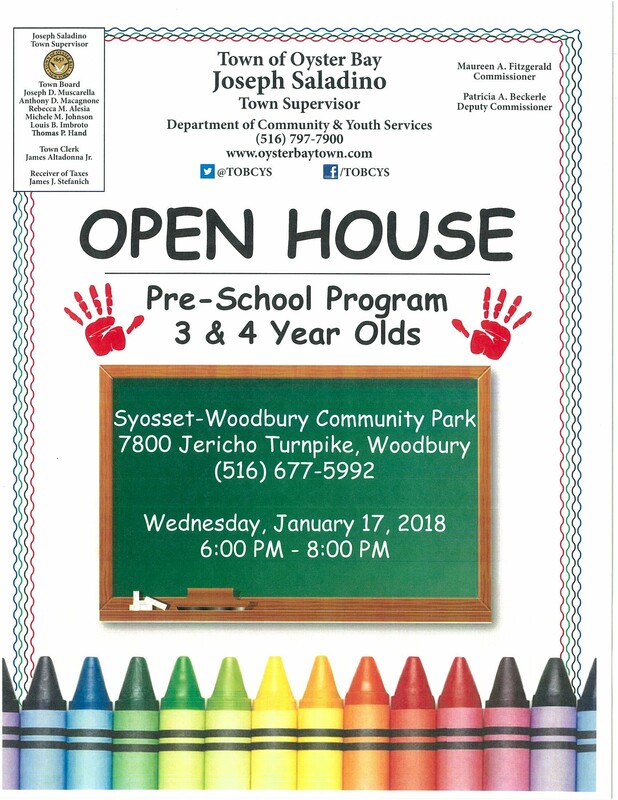 The Pre-School Program has two locations, one in the Syosset-Woodbury Community Center in the Syosset-Woodbury Community Park and one in the Marjorie R. Post Community Park in Massapequa. Enrollment is open to three- and four- year old children of Town of Oyster Bay residents. The program offers varied experiences to help each child grow physically, emotionally, socially and intellectually. Learning experiences are integrated through games, dramatic play, block-building, stories, rhythms, music and arts and crafts. Emphasis is placed on the development of large and small muscles. Each class is staffed with a fully qualified and accredited teacher, ably assisted by warm and caring assistants. In our flexible program, your child learns to be independent, but always with the awareness that there is a teacher at hand. Our teachers strive to stimulate individual ability, train for good listening habits and develop oral language competency. The pre-school programs offer a morning and an afternoon session. The morning session is from 9:30 am – 12pm and the afternoon session is from 12:30pm – 3pm. Children can attend the program either three days a week (Monday, Wednesday, Friday) or five days a week. Registration is done the December prior to the year attending the program. Applications become available at our pre-school open houses in early November. Please call the Department’s main office at 797-7900 for further information including tuition rates, open house dates and application deadlines.